I love breakfast. It’s seriously the best meal out there. If I could have brunch out every day, I’d be totally happy. But sometimes you need to save money and calories. Tomorrow, I’m having Sunday Brunch out with friends. So making something special at home that hits the spot was the right way to go. According to Facebook, you all love runny yolks as much as I do. So tomorrow morning… or really right now… save yourself a few bucks and make this delightful breakfast creation. Fry the bacon in a small skillet over medium flame until desired level of crispiness. In the meantime, toast your bread and slice your avocado. 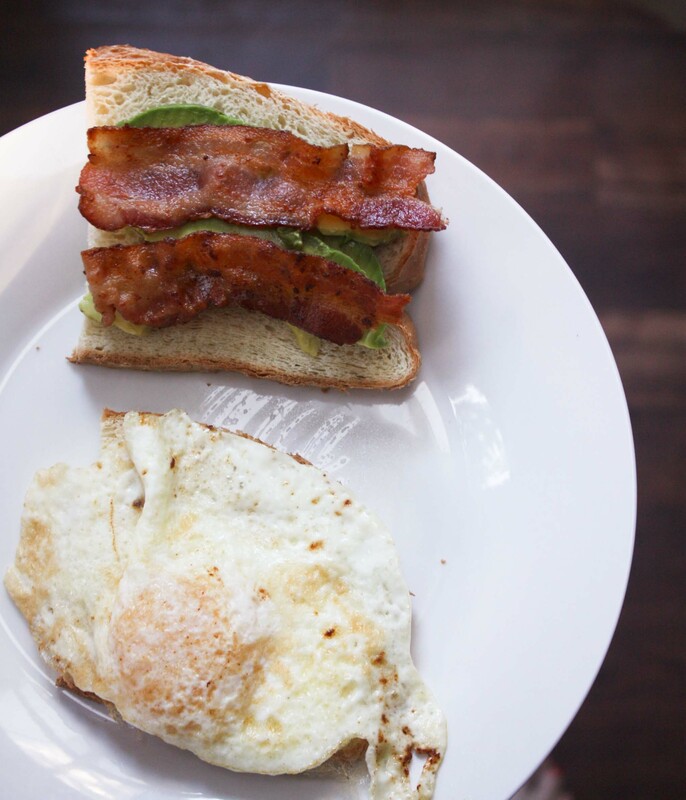 Remove bacon from pan and place on a paper towel, once cooled, break in half so you have two pieces. Wipe off some of the bacon grease from the skillet. Turn flame on med/low and crack egg into pan. Once the white part has set enough for you to flip it, flip the egg and cook an additional minute (or more if you’re blasphemous and don’t like runny yolks). Transfer egg onto 1 slice of bread. On the other side, lay slices of avocado then bacon. You’d think that based on the number of desserts I made I would be all about sweet breakfast items, but no. I generally prefer savory breakfast foods. What about you? Do you prefer savory or sweet breakfast? What’s your favorite breakfast/brunch menu item? I am a big fan of breakfast sandwiches. This one looks and sounds REALLY good. I would love to try it with vegetarian “bacon” or tempeh! I like a savory breakfast with a little something sweet afterwards. Oh, my goodness! I haven’t had one of those sandwiches for a long time. Mm and yes, the yolk has to be runny! I have never had this combination before, but I totally like it ! Avocado needs in my opinion always a little pinch of salt, but in this case, the bacon will completely replace the salt, yum ! I totally agree. Usually I think avocado needs salt, but I thought all of this (even the eggs) were great without salt! I’m so not a breakfast person. I totally eat it, but I’m fine just having bowls of cereal and fruit for months at a time. I feel like I go through breakfast phases– right now, I’m in a frozen waffle phase, which is really random. Let’s do brunch! 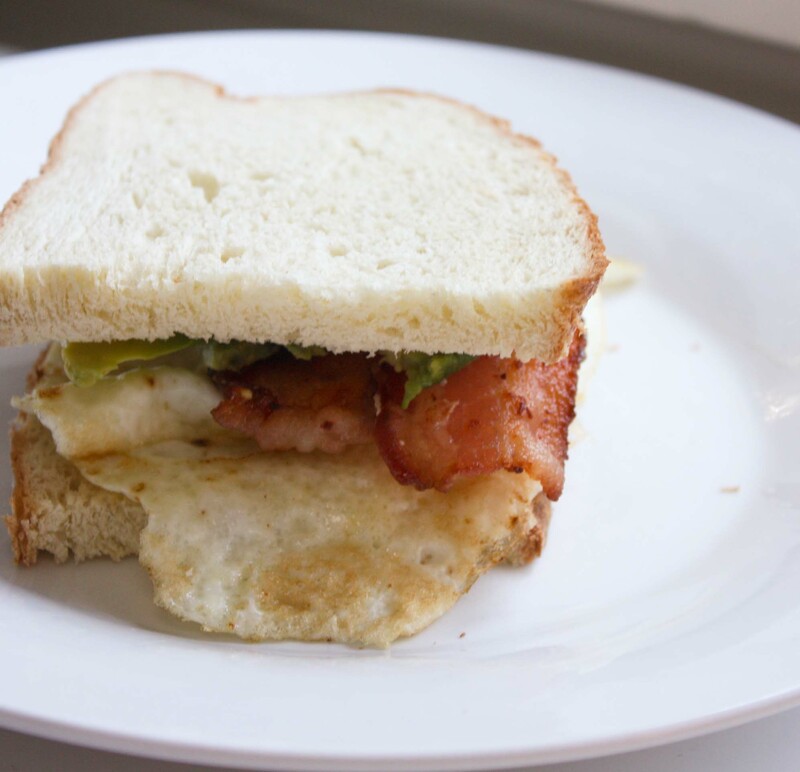 I love how creamy runny yolks are…they really tie together a good breakfast sandwich! New to your blog and found ya on Tasty Kitchen! Your recipes look great and I’m excited to have found your site! Like you, I would eat brunch every day if possible. Unfortunately I usually just have a breakfast burrito during the week and of course when I am craving a major brunch now (thanks to your sandwich here), it’s almost blizzard conditions.